This is one of a series of Q&A articles with East Kingdom Officers. 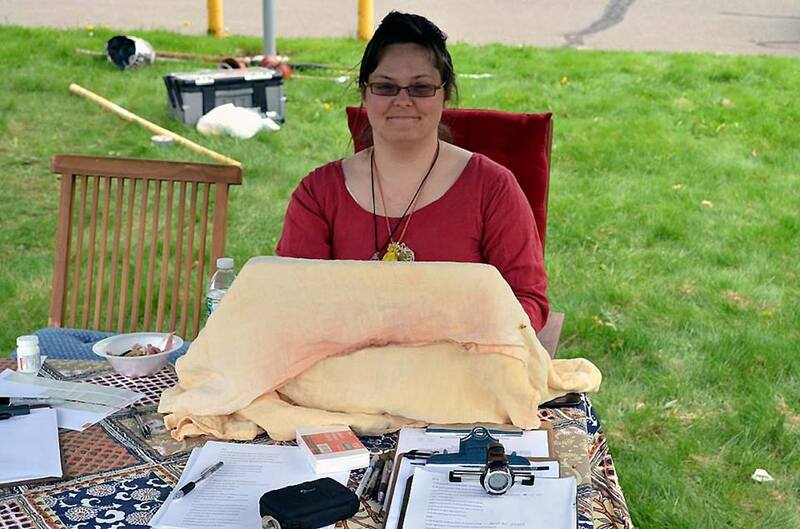 The Gazette thanks Lady Sabina Luttrell, East Kingdom Mistress of Lists, for answering our questions. My job as the Kingdom Minister of Lists is multi-layered. My very visible task is to run the Crown Tournament of the King and Queen twice a year. I am also responsible for running the King and Queen’s Champions Tournaments for Heavy Rattan Combat and Period Rapier. “Running” means that I check all fighter and rapier authorizations to make sure that everyone is safe and playing within the rules of the East Kingdom. I am also the scorekeeper and historian for each tournament. I keep track of who has won what bouts and who moves on to the next round of the tournament. Behind the scenes is a much busier place. All rattan fighters and rapier fighters are required to authorize in different weapons forms. They are also required to sign a waiver to participate in practices and tournaments in the East Kingdom. I am the person that keeps track of all of those waivers and weapons forms. I, along with my database deputy, update a central database roughly once a month, that allows all marshals and MOLs (local minister of lists) to do their jobs efficiently. I LOVE being the Minister of Lists. I enjoy interacting with the people of the East Kingdom. It is so much fun to see other people enjoying themselves. I get a front row seat to all of the best tournaments and get to cheer on everyone! I also have to admit that I like to organize things. Paperwork and databases are fun to me. Call me crazy! My goal for this term, as in last term, is to continue to update entries regarding all combatants and marshals. If you ever see anything in the database that is incorrect, I would love to fix it. I am always looking for MOLs for local groups. MOLs at large are also very important and help the fighters of the East more than you would imagine. My first event was around 7 years ago with my family. We attended a very wet and rainy archery event in the Barony of Stonemarche. My children were young and we didn’t stay long, but the people were very friendly so we decided to try again. We next attended A Shire 12th Night in the Barony of Smoking Rocks. This is a 10 foot rule event that is geared toward a specific time period. I think that year it was 1180? Anyway, it was a fabulous event and again, the people were fantastic. I couldn’t wait to attend more. All in all, I would have to say that it is the people of the East that keep me coming back. Three people have really shaped my SCA experience. The first was Duchess Avelina Keyes. She was the first person that my husband and I made contact with in the Society. She was welcoming and encouraged our enthusiasm for archery and “All the things”. She made sure that we felt welcome and at home. The second and third great SCA influences were Baroness eLeri of Concordia of the Snows and Baroness Lily of the same. These ladies were having so much fun running tournaments! They loved every minute that they spent behind an MOL table. I couldn’t help but fall in love with them both and want to spend more time doing what they were doing and spend it with them. I am so grateful that I was able to spend the time that I did with eLeri. She showed me what it was to have a true love of service to the people of the East.